I noted last week that the pundits (a sample of recaps/review articles on prominent websites) had graded many of the contestants much higher than WhatNotToSing did last week. This week is more of the same. The sample is of 24 sites, and I recorded whether or not the person liked the performance. The error bars on both sets are 1 standard deviation. 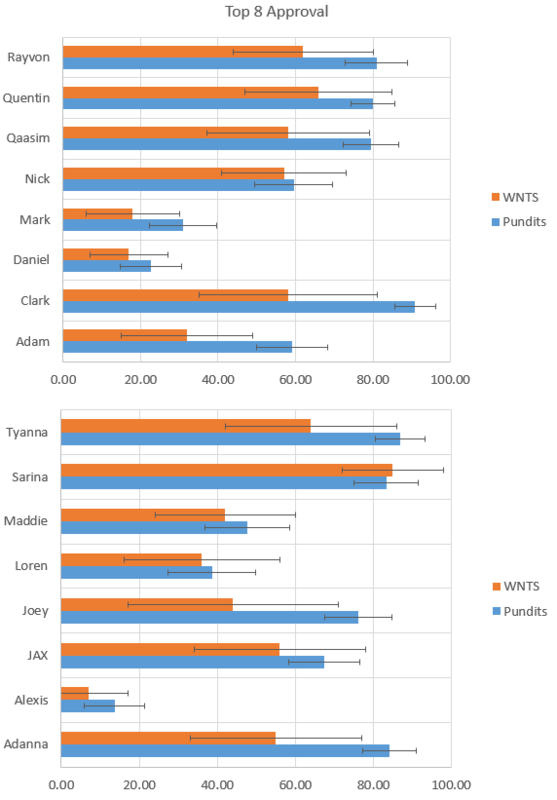 Adanna, Tyanna, Adam, and Clark are clearly being rated significantly lower by whoever WNTS samples than the pundits. Now, obviously that’s a sampling thing: if you take any different subset of people, especially a small subset like I did, you’re going to get a different answer. However, I wonder if WNTS is oversampling younger people who are not necessarily indicative of the voting public. I’m thinking, of course, of Caleb Johnson, last year’s winner. WNTS had him way behind Jena and Alex. But he went all the way to the top. I can see Caleb being more likable to the audience than the awkward Alex Preston, but Jena Irene? I have to think the audience actually preferred him. And that didn’t show up very much in the numbers. Caleb overall had a 52% on WNTS from the Top 5 on, fully 10 points below Jena. Maybe that’s not a huge margin, but it has me wondering. White guys in general seem to do a bit poorer on WNTS than the voting results would indicate. I’m going to keep track of this separately and see if there’s any story there. If nothing else it’s just a different perspective.